I think we can all agree that one of the top 3 reasons to have a front porch is seasonal decorating. Right? We added on our huge front porch in the spring and have been finishing details, siding, lattice, ceiling, and all of the actual front porch construction for months. Now that it is finally put together, I am so excited to have a stage for festive holiday decor, starting with fall! Not only does the porch itself offer a great decorating opportunity, but I love the decor spilling down the front steps and towards the walkway. I was once again thrilled to partner with The Home Depot to style my porch (remember when I designed the back patio for spring?) 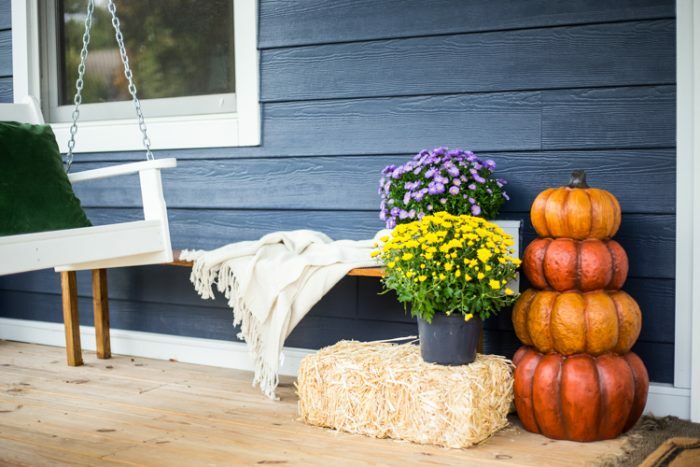 This time around, I focused on creating a cozy, festive, and still somewhat neutral space using easy front porch fall decor from The Home Depot. While I love Halloween, I want to decorate for fall even before it is time for witches and skeletons! I find a middle ground by beginning with some amazing harvest decorations that will last through the whole season from September through the end of November. This way, I can add in the spooky decor in October, and leave the base front porch fall decor up all season through Thanksgiving. I love decorating with nature-inspired colors, textures, and items. 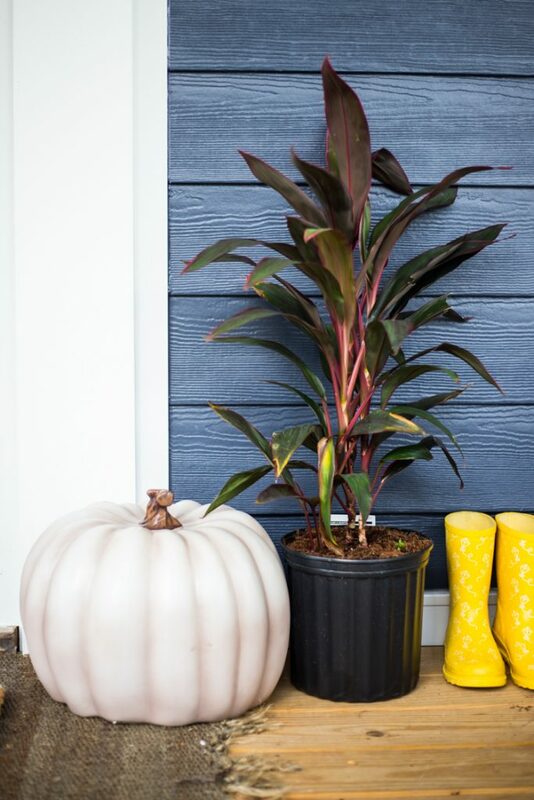 Pumpkins are high on my list of fall decorations, and I love these faux versions from The Home Depot that don’t rot in the rain and heat! As an added bonus I can use them year after year! 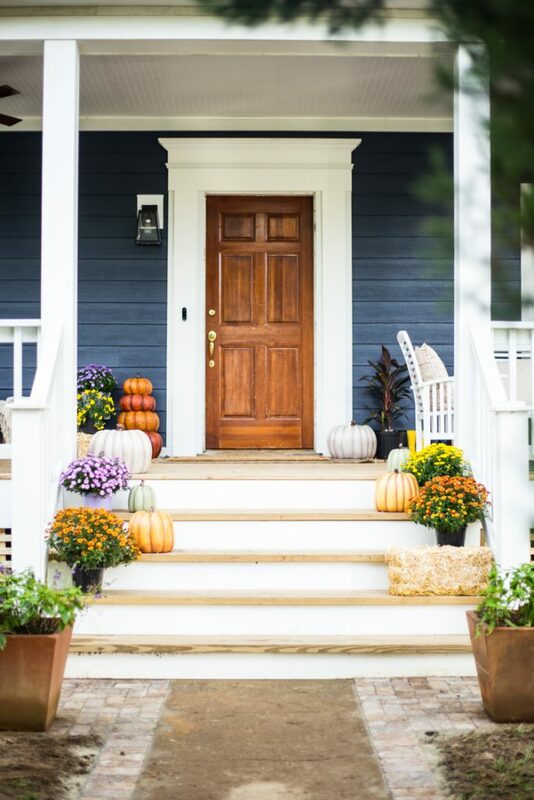 This Harvest Stacked Pumpkin next to the front door serves as a perfect anchor for the harvest theme of the porch. It is sturdy but not too heavy, so I don’t worry about my kids playing and swinging nearby. The bright orange looks amazing against our newly re-sided blue house, too! I also found these Harvest Stackable Pumpkins that can either be stacked up, or used separately. I love the color variations, that remind me of the fairytale pumpkins I usually buy fresh every year. That subtle white and green is so pretty! With two sets I was able to spread the pumpkin love out around the front porch and down the steps. Corn fields and hay bales feel so harvest inspired! I love the natural element, and although they are a little messy, the breeze of the season keeps blowing the stray bits away. 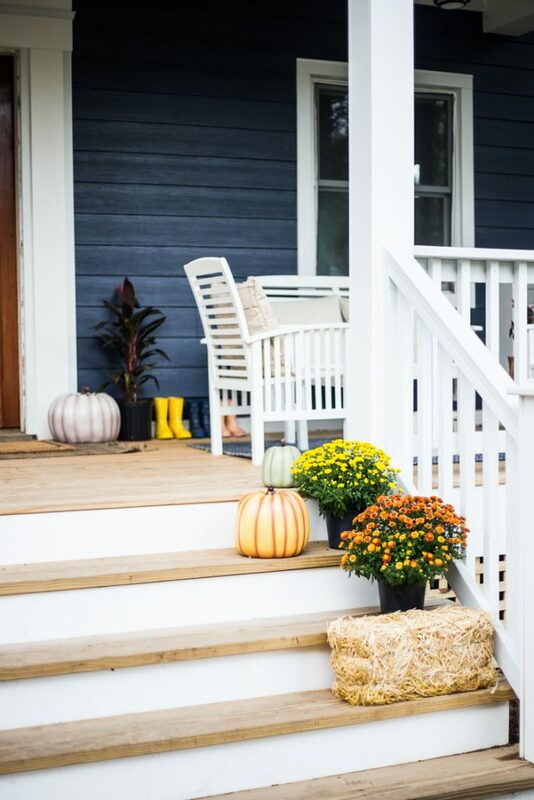 Adding just a couple of these mini straw bales to my front porch fall decor creates such a fun, festive feel. I also love the opportunity that adding levels with the bales gives. I can stack them, add more plants as I collect them, and they will be a perfect place to add spider webs and skeletons as we get closer to Halloween! I mean, I have never been one to resist the urge to buy plants, and fall is no exception. 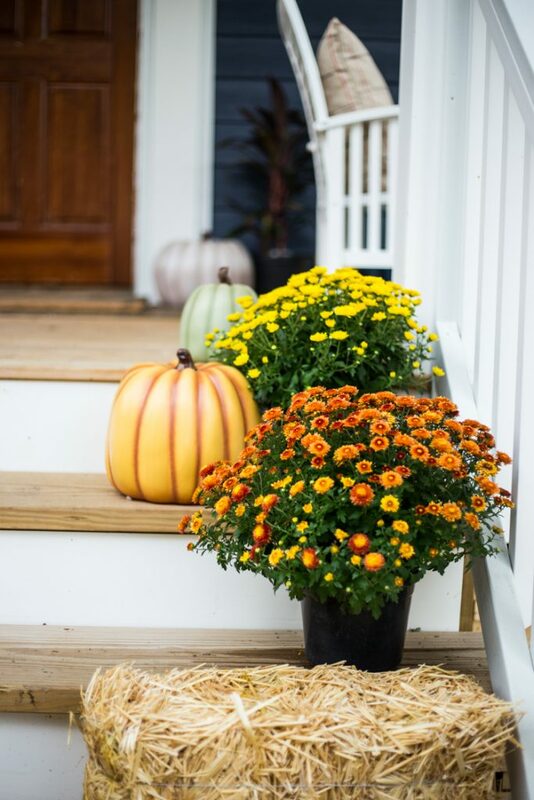 I love the way bright mums add such a live energy to front porch fall decor. They come in such a great variety of colors and sizes, too, there are sure to be a few that fit just what you are looking for! Along with mums, I grabbed a couple other houseplants that looked like they would be happy on the porch, and tossed them into the mix, as well. With as much rain as we have in Richmond combined with how much Plum loves to water for me, I won’t have to worry too much about keeping everything alive for the next couple months. Adding some soft linens as the weather cools down makes the front porch a fun, comfortable place to hang out. We bring them in each night, especially if it looks like it will rain, but I sure love having the space welcoming and lovely for when the kids feel like sitting and swinging with me. 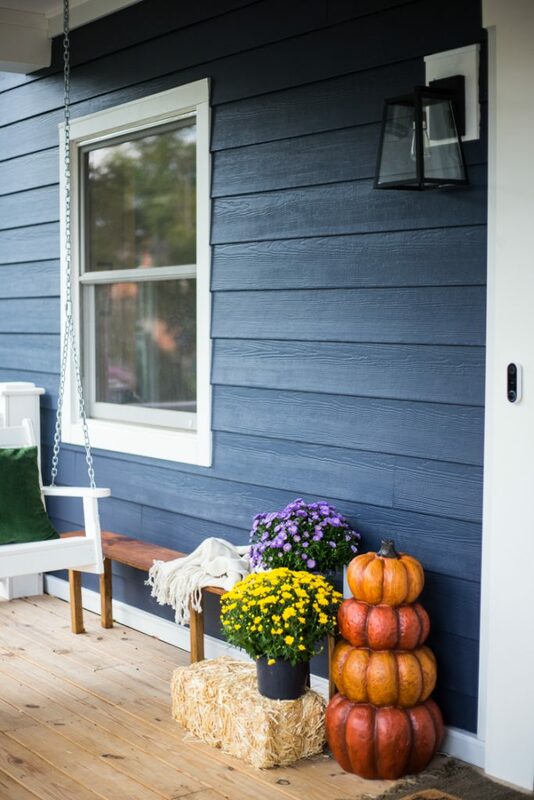 Make sure to head over to The Home Depot Blog for a more looks at my finished front porch fall decor, and learn my Top 3 Tips for Easy Fall Porch Decorating.